The few weeks before Christmas were usually busy ones for Mrs Bird. There were so many mince-pies, puddings, and cakes to be made that much of her time was spent in the kitchen. This year matters hadn’t been helped by the fact that Paddington was at home for most of the day ‘convalescing’ after his illness. Paddington was very interested in mince-pies, and if he had opened the oven door once to see how they were getting on, he’d done it a dozen times. Paddington’s convalescence had been a difficult time for the Browns. While he had remained in bed it had been bad enough, because he kept getting grape-pips all over the sheets, but if anything, matters had got worse once he was up and about. He wasn’t very good at ‘doing nothing’ and it had become a full-time occupation keeping him amused and out of trouble. He had even had several goes at knitting something – no one ever quite new what – but he’d got in such a tangle with the wool, and it had become so sticky with the marmalade, that in the end they had to throw it away. Even the dustman had said very nasty things about it when he came to collect the rubbish. Paddington liked shopping. He always enjoyed looking in the shop windows and since he had read in the paper about all the Christmas decorations, he had thought of very little else. Besides, he had a special reason for wanting to go shopping this time. Although he hadn’t told anyone, Paddington had been saving hard for some while in order to buy the Browns and his other friends some presents. He had already bought a frame for his picture and sent it, together with a large jar of honey, to his Aunt Lucy in Peru, because presents for overseas had to be posted early. He had several lists marked ‘SEACRET’ which were locked away in his case, and he had been keeping his ears open for some time listening to conversation in the hope of finding something they all needed. Crumbold and Ferns was a very old-established shop where everyone spoke in whispers and all the assistants wore frockcoats. Only the best people went to Crumbold and Ferns. And when Paddington set off with Mrs Brown after lunch, even Mrs Bird had to admit he looked smart enough to go anywhere. 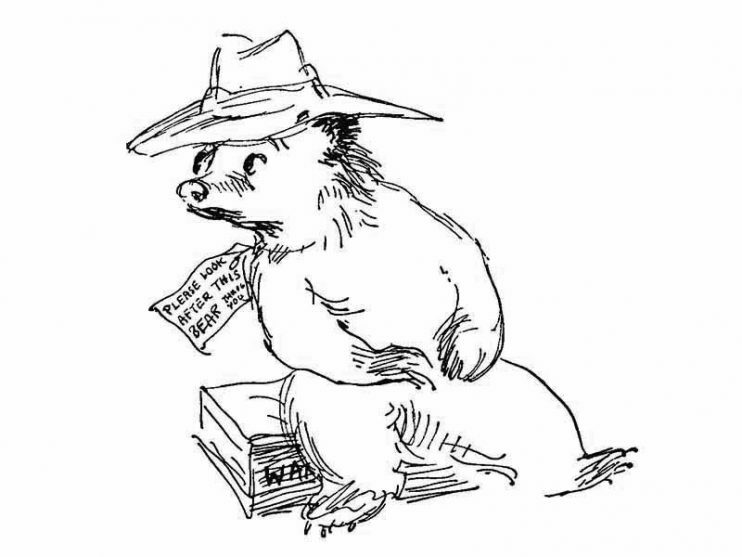 His duffle coat, which had just come back from the cleaners, was clean, and even his old hat – which Paddington always insisted on wearing when he went on shopping expeditions – looked unusually neat. All the same, as Paddington waved his paw at the corner, and Mrs Bird turned to go back indoors, she couldn’t help feeling glad she was staying at home. Paddington enjoyed the journey to Crumbold and Ferns. They went by bus and he managed to get a front seat downstairs. By standing on the seat he could just see through the little hole in the screen behind the driver’s back. Paddington tapped on the glass several times and waved his paw at the man behind the wheel, but he was much too busy with the traffic to look round – in fact they drove a long way without stopping at all. But he was a kindly man and when Paddington said he was sorry, he explained to him all about the signals for making buses stop or go on, and he gave him the end of a roll of tickets as a present. When he had collected all the fares, he came back again and pointed out some buildings of interest to Paddington as they passed them. He even presented him with a large bulls-eye which he found in his money bag. Paddington liked seeing new places and he was sorry when the journey came to an end and he had to say good-bye to the conductor. There was another slight upset when they reached Crumbold and Ferns. Paddington had an accident with the revolving door. It wasn’t really his fault, but he tried to follow Mrs Brown into the store just as a very distinguished-looking gentleman with a beard came out the other side. The man was in a great hurry and when he pushed the revolving door it started going round at great speed, taking Paddington with it. He went round several times until he found to his astonishment that he was outside on the pavement once more. He had a brief glimpse of the man with the beard waving to him from the back of a large car as it drove away. The man also appeared to be shouting something, but Paddington never knew what it was, for at that moment he trod on something sharp and fell over backwards again. He sat in the middle of the pavement examining his foot and found to his surprise that it had a tie-pin sticking in it. Paddington knew it was a tie-pin because Mr Brown had one very like it – except that his was quite ordinary, whereas this one had something big and shiny fixed to the middle of it. Paddington pinned it to the front of his duffle coat for safety and then suddenly became aware that someone was speaking to him. “Are you all right, sir?” It was the doorkeeper – a very dignified man in a smart uniform with lots of medals. So he held up the passers-by with a stern wave of the hand while they searched the pavement. As he guided Paddington back through the revolving door to Mrs Brown, who was waiting anxiously on the other side, he tried hard to look as if helping a young bear of quality find his bulls eye was an everyday event at Crumbold and Ferns. Paddington returned his salute with a wave of the paw and then looked around. The inside of the shop was most impressive. Everywhere they went, tall men in frock-coats bowed low and wished them good afternoon. Paddington’s paw was quite tired by the time they reached the Household department. As they both had some secret shopping to do, Mrs Brown left Paddington with the assistant and arranged to meet him outside the entrance to the shop in a quarter of an hour. He turned and looked down at Paddington as Mrs Brown left, brushing an imaginary speck of dust from his frock-coat. Secretly Paddington was feeling rather overawed by Crumbold and Ferns, and not wishing to disgrace Mrs Brown by doing the wrong thing, he gave his own coat a passing tap with his paw. The assistant watched with fascination as a small cloud of dust rose into the air and then slowly settled on his nice, clean counter. The man coughed. “Oh dear,” he said. “How very unfortunate.” He gave Paddington a sickly smile and decided to ignore the whole matter. “And what can we do for you, sir?” he asked, brightly. Paddington looked round carefully to make sure Mrs Brown was nowhere in sight. “I want a clothes-line,” he announced. “A what?” exclaimed the assistant. The assistant swallowed hard. He found it impossible to understand what this extraordinary young bear was saying. Paddington sighed. It really was most difficult trying to explain things sometimes. Climbing up on to the counter he unlocked his suitcase and withdrew an advertisement which he’d cut from Mr Brown’s newspaper several days before. Paddington looked suitably impressed as he climbed down, holding on to the rope with his paw. “You see,” continued the man, bending over the counter, “it is all quite simple. The clothes-line is all contained inside this box. As you walk away with the rope, it unwinds itself. Then, when you have finished with it, you simply turn this handle…” A puzzled note came into his voice. “You simply turn this handle,” he repeated, trying again. Really, it was all most annoying. Instead of the clothes-line going back into the box as it was supposed to, more was actually coming out. “I’m extremely sorry, sir,” he began, looking up from the counter. “Something seems to have jammed…” His voice trailed away and a worried look came into his eyes, for Paddington was nowhere in sight. As it happened, the assistant wasn’t the only one to feel worried. At the other end of the clothes-line Paddington was already in trouble. Crumbold and Ferns was filled with people doing their Christmas shopping, and none of them seemed to have time for a small bear. Several times he’d had to crawl under a table in order to avoid being trodden on. It was a very good clothes-line, and Paddington felt sure Mrs Bird would like it. But he couldn’t help wishing he’d chosen something else. There seemed to be no end to it, and he kept getting it tangled round people’s legs. He went on and on, round a table laden with cups and saucers, past a pillar, underneath another table, and the clothes-line trailed after him. All the time the crowd was getting thicker and thicker and Paddington had to push hard to make any headway at all. Once or twice he nearly lost his hat. Just as he had almost given up hope of ever finding his way back to the Household Department again, he caught sight of the assistant. To Paddington’s surprise, the man was sitting on the floor, looking very red in the face. His hair was all ruffled and he appeared to be struggling with a table leg. “What have you done with the other end?” shouted the assistant. He wasn’t in the best of tempers. It was hot and noisy under the table and people kept kicking him. Apart from that, it was most undignified. “Where?” shouted the assistant. He didn’t know whether it was simply the noise of the crowd, but he still couldn’t understand a word this young bear uttered. Whenever he did say anything it seemed to be accompanied by a strong crunching noise and a strong smell of peppermint. Paddington looked at the man uneasily. He looked rather cross and he was beginning to wish he had left his bulls-eye on the pavement outside. It was a very nice bulls-eye but it made talking most difficult. It was as he felt in his dune coat pocket for a handkerchief that it happened. The assistant jumped slightly and the expression on his face froze and then gradually changed to one of disbelief. The assistant crawled out from under the table and drew himself up to his full height. With a look of great distaste, he withdrew the remains of Paddington’s bulls-eye from his ear. He held it for a moment between thumb and forefinger and then hurriedly placed it on a nearby counter. It was bad enough having to crawl around the floor untangling a clothes-line – but to have a bulls-eye in his ear – such a thing had never been known before in Crumbold and Ferns. He took a deep breath and pointed a trembling finger in Paddington’s direction. But as he opened his mouth to speak he noticed that Paddington was no longer there. Neither, for that matter, was the clothes-line. He was only just in time to grab the table as it rocked on its legs. As it was, several plates and a cup and saucer fell to the floor. The assistant raised his eyes to the ceiling and made a mental note to avoid any young bears who came into the shop in future. There seemed to be a commotion going on in the direction of the entrance hall. He had his own ideas on the possible cause of it, but wisely he decided to keep his thoughts to himself. He had had quite enough to do with bear customers for one day. Mrs Brown pushed her way through the crowd which had formed on the pavement outside Crumbold and Ferns. Standing on tip-toe, she peered over the shoulder of a bearded gentleman in front of her. The man was shouting words of encouragement as he tapped on the glass and she just caught a glimpse of a familiar paw as it waved back in acknowledgement. There was a ripple of excitement from the crowd as the door started to revolve once more. Everyone made a rush for Paddington, but the distinguished man with the beard reached him first. To everyone’s surprise, he took hold of his paw and began pumping it up and down. “Glad to know you,” repeated Paddington, looking as surprised as anyone. He pushed back the crowd of interested spectators to allow Paddington and the distinguished man a free passage. “Oh?” said Mrs Brown, doubtfully. “A diamond tie-pin?” exclaimed Mrs Brown, looking at Paddington. It was the first she had heard of any diamond tie-pin. “I found it when I lost my bulls-eye,” said Paddington, in a loud stage whisper. “An example to us all,” boomed Sir Gresholm, as he turned to the crowd and pointed at Paddington. Paddington waved a paw modestly in the air as one or two people applauded. “Ooh,” said Paddington. “Is it really?’ His eye glistened. He’d never seen such an enormous car before, let alone ever dreamt of riding in one. “One with bulls-eyes, please, Mr James,” called Paddington. “So am I,” said Paddington earnestly, as he gazed out of the window at all the lights. As the huge car drew away from the kerb he stood on the seat and gave a final wave of his paw to the crowd of open-mouthed spectators, and then settled back, holding on to a long gold tassel with his other paw. It wasn’t every day a bear was able to ride round London in such a magnificent car and Paddington wanted to enjoy it to the full. My name is Michael Bond, CBE and I am an author, most celebrated for my Paddington Bear series of books. I have made the Paddington Bear TV Show and was responsible for The Herbs children's programme. I was awarded the CBE for services to Children's literature and have been nominated for the Carnegie Medal in Literature. I am also a Friend of The Renault Bears. Do we really need to be reminded that Christmas is coming? I could just eat a marmalade sandwich. It’s such a perfect day… for building a sandcastles. Paddington has so many disasters but he always comes out the other end smelling of roses!! Today is quite exciting. You can now watch the trailer and book tickets for my new film Paddington2! I wonder if Paddington Bear does his own stunts in his new film? If anyone who lives in the London area would like to meet Paddington Bear exclusively at the Museum of London on 24th and 26th October he will be there from 11am for elevenses!! You could of met Moley (aka Catfish) if you knew where he was going to be. You could of met for marmalade sandwiches with PB. Anyone wanna come watch the sky burn with me? Who played Monster Mash at your wedding? Have you ever looked at someone and thought about how happy you’d be if you never had to see them again? Roy: Hey Bob, what you doing? Me: Putting my socks on. Stop the parenting train, I want to get off. Forgot to put the bins out last night and not one of you bears reminded me. I thought we were friends? Just pop home, my bastart missus sat on bastart arse watching fat eamonn on this morning. Went to make beans on toast for my lunch but had no beans. So just had toast. Prove you are Human: What is 9 + 4?